State Bank of India (भारतीय स्टेट बैंक) is the largest bank in India. With the growing digitalization, it has become easier for the account holders to access their accounts as per their convenience without wasting their time at the bank counter queue! Weren't the days irritating, when you needed to visit the bank and stand in a queue for any banking services? SBI has embraced the advanced tech developments to promote the brand digitally and offer incredible services to its customers. If you have limited time and don’t get time for accessing your SBI account, get registered for online banking and access the account according to your requirements. With internet banking facilities, you will be able to bring the bank to your computer, laptop or mobile! In fact, in your fingertips! With Internet banking online, you need not go to the bank, stand in the queue and wait for your number to access your account! You will get easy access to money transfer, cash withdrawal, account updates, etc. services. There are numbers of bank related work to be done with internet banking option. Get registered and activate your internet banking services with SBI and get easy access to many bank related works! Avoid visiting bank and wasting your time! Bring the bank services to your control with Internet banking! You must have an account at any branch of SBI and rest information you will get in this article! Step 1: If you wish to activate Internet banking services with SBI, you must keep your State Bank Debit Card as well the registered number with you. Turn-ON your laptop/computer connected to the Internet. Open the web browser on your device. 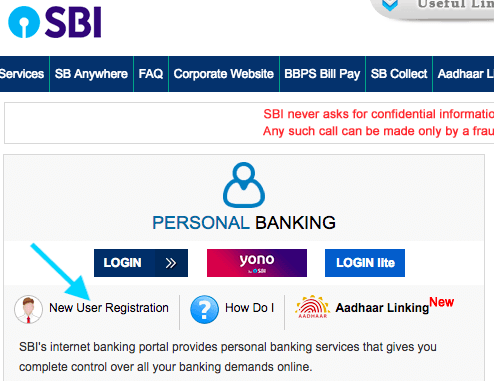 Visit the official website of SBI - https://www.onlinesbi.com and click on the Internet banking login page visible on the dashboard. Step 2:You will get directed to the internal page where you need to click on 'New User registration'. A popup box will appear, and you need to click on OK for approval and to move to the next step. Step 3: After clicking on OK, a new webpage will open in a small window. You will see several boxes on the new webpage, and you need to fill up the boxes appropriately. Filling up Account Number, CIF Number, Branch Code, Registered Mobile Number and Facility Required boxes is mandatory. Filling up the box for Country is optional. After filling the boxes appropriately, you need to fill the box Enter the Text as Shown in the Image precisely and click on 'Submit'. 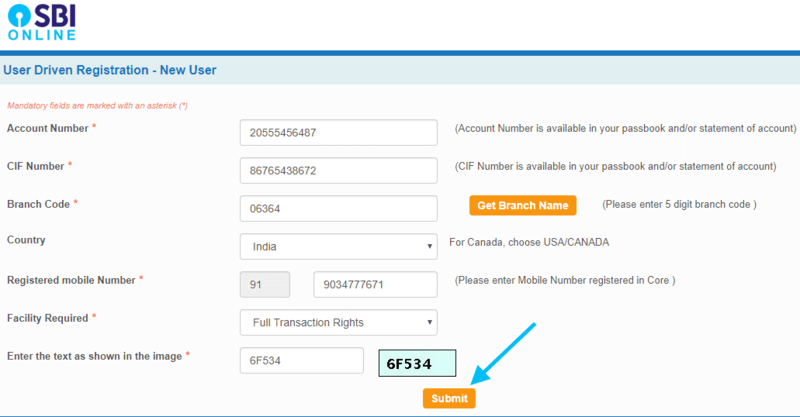 Step 4: After few seconds/minutes of clicking on Submit, you will receive one time password on the given registered mobile number. You need to enter the OTP number in the provided box and click on Confirm. Step 5: A new screen will appear on the screen displaying two options, i.e., I have my ATM card, and I do not have my ATM card. If you have your ATM card with you, you can go for sbi online registration without visiting the branch, and if you don't have ATM card, Internet banking can only get activated by the SBI branch only. It is mandatory to select one of the featured options and click on Submit. Step 6: To validate your debit card with Internet banking you need to transfer Rs 1 entering the card details, i.e., Card Number, Valid Till or the Expiry Date, Cardholder's name and the PIN. 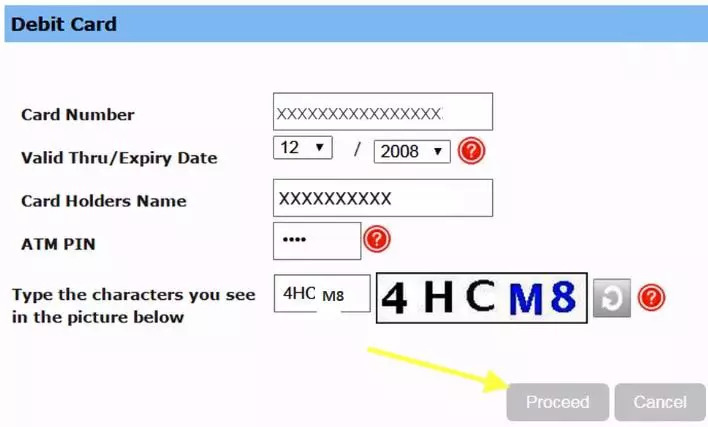 At last, you need to enter the characters that you can see in the box and click Proceed. Step 7: After you have made the transaction successfully, you will get the screen displaying temporary username and space to set the login password. After successfully entering the login password, the Internet Banking option will get activated. Step 8: Now, going back to the login page, you need to enter the temporary User ID and the set login password and click on Login. Set a new User ID and a Login password as well along with a Profile password. Now, you have successfully registered for Internet Banking. Following the process of getting registered for Internet Banking, you will be able to access your SBI account without visiting the branch. If you don't have an ATM/Debit card with you, to get registered for Internet Banking, you have to visit the bank. If after following the step-by-step process, you couldn't register for Internet Banking, visit the branch and request for net Banking services. sbi net banking online registration using a debit card without going to the branch. thank you so much, it's done, I successfully created my internet banking through online. I am trying to register for SBI net banking online using the classic ATM card, but I am facing error while registration.